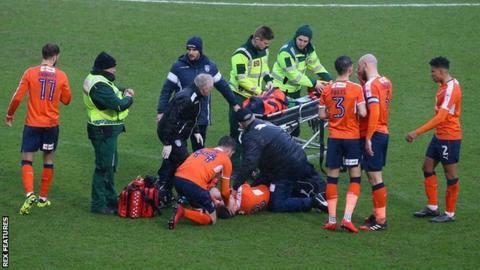 Luton Town midfielder Luke Berry has dislocated his left ankle and fractured his fibula, the League Two club have confirmed. The 25-year-old was carried off on a stretcher two minutes into Friday's 2-1 loss away to Colchester United. Berry went down after a challenge with Colchester midfielder Tom Lapslie. In a statement on their club website, Luton said former Cambridge player Berry would travel to London to see a specialist on Tuesday. He has scored seven times in 42 appearances for Luton this season after joining them from Cambridge for an undisclosed fee last summer. Boss Nathan Jones told BBC Three Counties Radio immediately after the game: "He's been transferred to (hospital in) Ipswich because the specialist is there. "It'll be a length of time before we get him back. It's a sad one really, the innocuous ones tend to be the worst."